This entry was posted on May 20, 2010 at 11:44 pm	and is filed under Nia. Tagged: Aikido, dance classes, Dance Workout, fitness, Free Dance, freedance, Jazz Dance, Jazzercise, Jazzercise classes, Nia, Nia Classes, Nia teachers, Tae kwon do, Tai Chi, workout, Yoga, Zumba, Zumba classes. You can follow any responses to this entry through the RSS 2.0 feed. You can leave a response, or trackback from your own site. Sometimes the best way to describe Nia to someone is truly about what it isn’t. It isn’t a cult or a religion. It isn’t just for women. Nia isn’t woo-woo*, but I think that some people think it is woo-woo because it is not generally understood that Nia is based on SCIENCE and the way the body was designed to move. I believe that for some when you are encouraged to listen to your own body, THAT is woo-woo partly because it goes against how we have been taught to exercise for so long. We’ve been taught to “DO THIS”, “DO THAT” so when someone says, move in a comfortable way it might sound woo-woo to some. Another reason, might be the use of imagination in class, someone might think that “reach for the clouds” is a little woo-woo because we don’t say “put your arm up high”. Also, Nia doesn’t FEEL like you are exercise when you are exercise so that might make people think it is woo-woo. These are things I have heard people say, so I am sharing that I understand how some people might think it is woo-woo. I thought it was woo-woo when I first discovered it. Not woo-woo as defined below, but I called it woo-woo. But then I researched more and discovered it is based on the body. *Woo-woo: adj. concerned with emotions, mysticism, or spiritualism; other than rational or scientific; mysterious; new agey. hah! A great list. I like this approach. Often times I try too hard to think of what Nia reminds me of, but I have never tried to list out what it does not remind me of. Well Nia actually might remind you of all of these things, but it actually is NOT these things. Nia might remind you of Jazzercise because we do get on the floor and do move in a way to strengthen our bodies. Nia might remind you of Zumba because we dance and move to music and Nia is a lot of fun. Nia might also remind you of martial arts, dance arts, or yoga because we might do moves consistent with those arts, but we are not DOING Jazzercise, Zumba, martial arts, or yoga in the true sense. So that is why I did this list because Nia might actually REMIND you of a lot of things on that list, but Nia is NOT actually any of those things. Hopefully this list might actually compel people to re-visit what Nia is and this list might help them get a better idea. But of course, the best way to really learn what Nia isn’t and what Nia is to go to a class. Oh, I think I will add that to my post. Thank you for reading and commenting, Love. I’m giggling that there is actually a definition for a term such as “woo-woo”. That just blows my mind!! LOL. I know, I didn’t really think there would be but I decided to check first. Since there was that actually changed my response to your comment. I don’t think of woo-woo exactly as they defined it, so that is why I went into a bit of a long response to your comment. Because I DO think people think Nia is woo-woo. I am adding to my post something about the best way to learn what Nia isn’t and what it is is to go to a class! Thank you for stoppoing by and commenting. I love comments. I love this. I so wish there was Nia here. I think I am going to contact the studio where I did pilates and ask if they teach it. Love your list of what it isn’t cuz it sort of tells me what it is! Yeah, or look at the main Nia website and call the teacher that is CLOSEST to you and s/he might know of a place that it is taught. Not all teachers list their classes on the site. So call whomever is clostest to you. I had asked (in a post or a comment) where you were because I was going to do that for you, but . . . . you can do it! Also, there are DVDs and you can do it in your living room, but a class is so much better because you get the energy from the other participants. I really think that it might be something that you would like. It movement that allows you to be authentic and move from the heart and learn at the same time and I sense that these are things that you enjoy. And thank you for validating my train of thought. Last night when I was racking my brain trying to come up with something, it dawned on me that sometimes it DOES help people learn about something when they see what it isn’t! Nia isn’t just for dancers. Nia isn’t a hippy trip. Tina, Tina, Tina! Yay! Thanks for being here! Happy to be here, Terre! Great! I guess I am one of those people that get it when it’s put to what it’s not. It DOES sound wonderful and freeing. How cool. Love the comments from the other Nia ladies too. Yeah, I think a lot of us understand some things when we understand what “it” isn’t. We all learn differently and sometimes we need information input differently. It is wonderful and freeing. It is GREAT exercise, but so much more. I LOVE all the comments from the other Nia Teachers too. And thank you, Angelia. Thank you for stopping by and thank you for commenting. I never even came across Nia until I found your site over at Zebra Sounds. I only took a cursory glance at what it is, but once I have more free time, I need to look at the details. It sounds a lot more focused than anything else I’ve come across. Does it bear any similarity to Kenpo? At any rate, this is nice list you have here. It really helps to define something by what it isn’t than what it is. Aren’t we soooo lucky to have J.? I had to look up “Kenpo”, and from what I read it sounds like the term is used for different types of martial arts. Nia’s focus is movement. 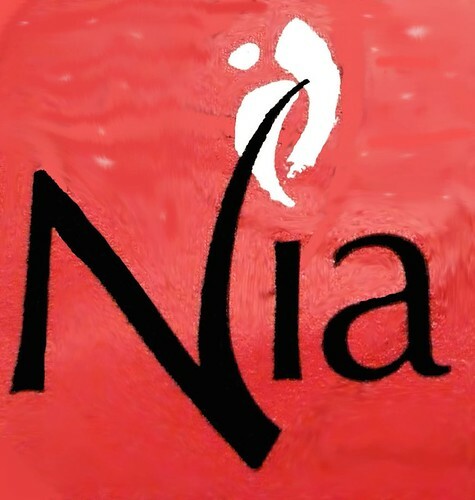 Nia incorporates all types of movements from different movement forms and borrows some of the philosophies or elements. It is a fusion of many things. The focus is primarily on moving for comfort, ya know kind of the “move it or lose it” idea. So we just keep moving and then the more you move the better you feel and it just keeps going and going. Thank you for so much for looking. And when you have time I have informtion on my site and many, many more posts (about 64) about Nia. I bet they have it in your area. Thank you for stopping by and commenting, “Eman”. hi I love this post.. Thanks for stopping by here and commenting.